Dreaming in Blush: My Thoughts on a "Capsule Wardrobe"
A) Can I just say that I freaking love that you are blogging again?! Please never stop! B) Haha, you're so right that guys just effortlessly have capsule wardrobes and don't even know it. C) I read on a blog post about cleaning out your closet recently: "Don't ask yourself what you can get rid of, ask yourself what you have to keep." Looking at it that way helped me SO much. I've spent years building a capsule wardrobe from www.Hush-uk.com in the UK. 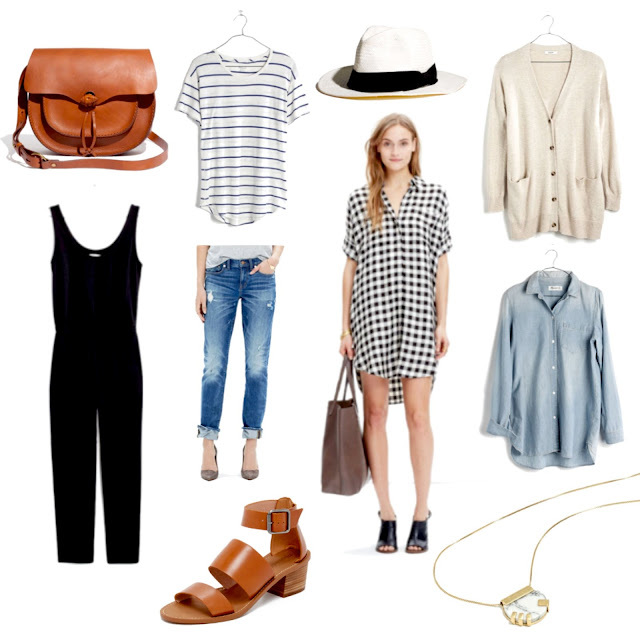 It's certainly easier to pack for a holiday when everything is designed to go together. Try Everlane! Their clothes are great quality and made in the USA. I'm working on doing the same thing with my closet. I completely and utterly agree, 1000% !! I've wanted to have this kind of wardrobe for years now but never knew of it as a "capsule wardrobe." I don't have nearly as many clothes as you do, but I have a similar situation in that none of my clothes pair well! And I have far too many ratty t-shirts to be okay. I blame a lot of it on the fact that I'm still in college and, well, let's be honest, I'm not trying to impress anyone in my engineering school. I essentially need to buy a whole new closet this summer once I start working and I want to do this same thing! As far as key pieces, I think that the big thing is having bottoms that go with everything. Tops can be different and trendy and not have to "go" necessarily, so long as every top can be paired with any of your bottoms. Also having sweaters, jackets, etc. that can go with almost any piece is a must. Loved this post, Elle! Your blog is inspiring me so much lately! I love it! I have also been in the process of transitioning into a capsule wardrobe. I moved recently and realized just how much unnecessary crap I have and have since tried to get myself in the mindset of buying quality not quantity. And one of my go-to stores now is Madewell. They have really great pieces that last long and transition really well from season to season. Keep a look out for sales and you can snag some pretty great deals. Their jeans, knits and shoes are some of the best investments. I agree with the other commenter about Everlane, as well! I can fit everything in a carry on, as far as my wardrobe. And I do have a lot of color, actually. I think it's important to figure out the 'why', that'll help you declutter. It sounds like you figured out why you want to do it, but also figure out why you had so much in the first place. Was it actually love of clothes or just wanting a full closet, wanting to show it off in videos, not wanting people to call you out on wearing the same stuff on instagram? (no judgment, I know fashion bloggers struggle with all of those things.) Once you figure out why you had too much to begin with, it'll be easier to part with things and also not collect more in the future! You have to let go of the mental roadblock before you can let go of the clothes. If you don't want to get rid of any of your clothes you should try putting outfits together in advance. You could either spend one evening a week putting together your outfits for the week or you could store things that go together in the same place. If you literally can't make something match something you already have you probably should just pass it on. I'm in such a wardrobe rut right now. I have a full time job, and what works best for me is to have good quality dress pants (black and shades of grey for me), and then I can pair whatever top I want. That's worked for 12 years. But I've realized in the past year that most of my tops are the same thing in different shades--sometimes exactly the same top, sometimes just very similar. (I have more silky short-sleeved blouses and "Portofino" tops from Express than I care to reveal.) That's great for getting ready in a hurry, but I'm a little bored with it and want different styles and possibly--and this is big--a few tops with *prints*. So I suppose I have kind of a capsule wardrobe for work purposes, but I want to bring in something new, other than a jacket or jewelry, to shake things up. Basically, I have the opposite problem from you! I've got what would be defined as a capsule wardrobe. All my clothes are either neutral colored (black or grey) or "cool toned" jewel toned solids in purple, blue, and green. Generally, everything goes together and outfits are a breeze. I wear a LOT of black wrap dresses. However, I still have clothes/closet anxiety. I get really envious of people wearing clothes that don't fit my rules that I've set up for myself. Like, "I know I look terrible in hot pink, but damn, I'd give my left pinkie to add that dress to my collection" kind of stuff. It's definitely a girl problem. It's worse because I already have anxiety problems. Though I know what colors and shapes suit me best (I'm plus-sized) I still REALLY REALLY want to follow trends to not look like a fuddy-duddy. Honestly, it's a "grass is greener" type thing, Elle. Just do you. My suggestion? Go ahead and PACK your clothes (Don't get rid of em) for 6 months. (You're in LA so the weather doesn't change much. I'm in Florida so I can relate) Only wear your "classic clothes" and things that you PHYSICALLY have to PULL OUT of storage for that time. After 6 months? Get rid of the packed clothes. I've been slowly working on building up a capsule wardrobe, I really want to love everything I own. Even having a small closet, there is so much that I just don't wear. And I feel like it hangs there and mocks me because I'm not using it and it's taking up space. I need to work on getting all my neutral pieces and then as trends change use small things for pops of color in my wardrobe, but I just can never seem to bring myself to do it. However I adore everything you bought, especially that shirt dress, it's so cute!! I've sooo tried to cut down on my clothing...errr!!! It's hard to do when you have those pieces you adore but go with only one other thing...Good luck, Elle! I can't wait to see how you do! I feel like when you're in the mood to declutter, it comes at just the right time to encourage me to declutter! I'm going to have to go through my closet and purge. Luckily I love dresses so they don't really need to match with anything, but there are tons of tops and pants I need to donate that never get worn. I love this! I also just read The Life-Changing Magic of Tidying Up (and How To Be Parisian Wherever You Are). Both books were inspiring especially where my closet is concerned. I think I'm going to take inspiration from both books and give it my own twist. Having a capsule wardrobe in NYC is easy (all black everything!) but I still like color for warmer months so maybe I'll have two capsule wardrobes - is that a thing?! I look forward to seeing how your twist on TLCMOTU and the "capsule" wardrobe turns out. I have a capsule wardrobe and it is amazing! I always get compliments out and it takes me like 10 mins to get ready makeup and hair included! I really recommend watching Alison Anderson's video on purging your wardrobe she has great tips. The thing that really helped me was to go through and pull the pieces you can't live without first and every piece after that is negotiable. She talks about that in the video. Elle - you should check out Mademoiselle's blog and youtube channel. She has an amazing capsule wardrobe full of classic, beautiful pieces - very French inspired. but not boring and all neutral - she actually includes some colour which I really appreciate! Also she does dress up maybe a bit more than the average, but she has really amazing style and I think you'd like it. I too love the theory of a capsule wardrobe; however, I can't quite bring myself to get rid of a bunch of perfectly fine pieces that I do wear. Anyways, maybe the day will come sooner than expected considering I am moving into a dorm room next year. I love this idea! It actually works really well with my closet. Almost all of my clothing is solid colors. I actually just bought that cardigan this weekend and received the necklace for my birthday a few weeks ago! I've been trying to go through my closet and get rid of clothes. I should keep this in mind during my next clean out! I really don't have a capsule wardrobe, but now I really feel inspired to clear out some pieces and donate them! Do you have any information on a new mineral cosmetic company that is poping up all over called blush fusion? French inspired capsule wardrobes are my fav! Trying to do this myself. Inspiring, that's for sure. Time to get to work and clean up my closet!